There are several absurdities, starting with the casting. The rapper Common portrays a starchy military man but looks like he’s playing dress up, and has to hear lines from Gary Oldman (as the Chairman of the Joint Chiefs of Staff) like “I know you’re a war hero, but…” Gerard Butler is on an action movie streak (“Hunter Killer” was made by the same production team that gave us “Olympus Has Fallen” and “London Has Fallen” with Gerard), but his Scottish accent couldn’t pronounce the word “naval.” But the film moves along in a decent action-oriented pace, and does have a team of Navy Seals with a red bearded leader that would bite your head off if you said hello. That stuff was pure weird gold. 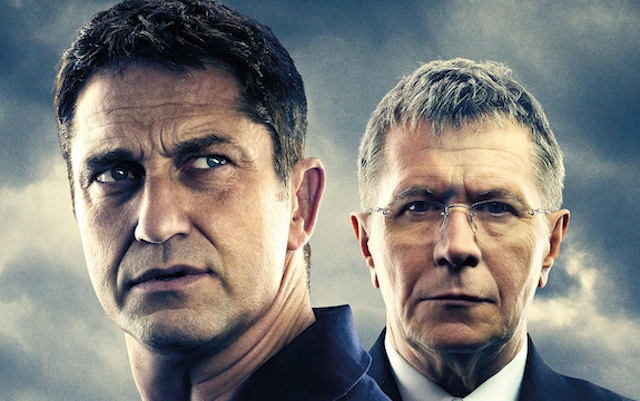 There is a crisis at a Russian Navy yard that alerts the Joint Chiefs of Staff and their chairman Donnegan (Gary Oldman) and aide Fisk (Common). A military coup of the Russian president (Alexander Diachenko) is taking place, and information is shared through NSA expert Norquist (Linda Cardellini). A “Hunter Killer” submarine is sent to investigate, with rogue Captain Glass (Gerard Butler) in command. On the way to that Navy yard, the U.S. sub rescues a Russian sub captain (Michael Nyqvist) whose ship had been sabotaged as part of the coup. The two leaders bond, and along with a crack U.S. Navy Seal Team rendezvous at the site of the coup. The plan is to get the Russian president away from his captors and prevent upsetting the delicate balance between heroism and World War 3.